Today’s bride and groom want to create a day that is filled with details that express their unique personalities. Going away from “traditional” and out of the box decor, music, flowers, signs and other details has been one way of accomplishing that. But sometimes just taking a traditional piece and adding modern touches and new uses provides a couple with the details and personality they desire without a huge outlay of time or expense. I created the ModernJen line of Guest Book & Anniversary Journals as traditional with a twist. Our books not only have beautiful modern patterns on the covers, but we added color on the interior pages as well. There are still plenty of lines for signatures, or personal notes in the front of the book, but we didn’t stop there. Use your wedding guest book for years to come when you record memories each year on your anniversary. Reminisce about the year or write down special anniversary date moments. 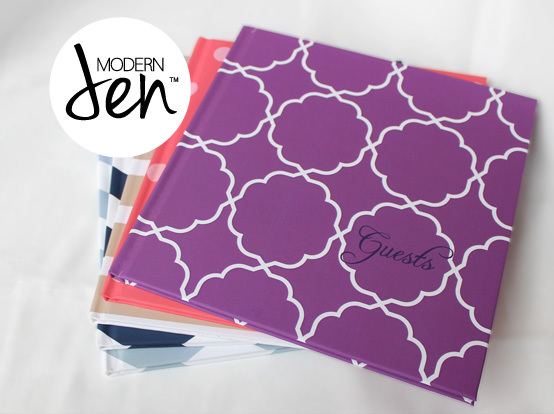 The ModernJen Guest Book & Anniversary Journals are beautiful hard cover books with a suede-feel cover. Choose from Gray Chevron, Navy Chevron, Sandy Tan Stripe, Purple Radiant Orchid Geo, or Cayenne-Red Polka Dot. Search for ModernJen at Amazon.com, BarnesandNoble.com, Booksamillion.com and others.